Beauty School Kennesaw: Is Beauty School Right for You? The decision to go to beauty school is a big one, but how do you know if it’s right for you? Have you been thinking about going to cosmetology school, but you’re unsure if it’s right for you or not? If so, you’re not alone. Deciding to go to any school takes research and a lot of thought on your part, and beauty school is no exception. Determining whether or not beauty school is the right option for you can change the entire course of your life and your future, but how do you decide? Here are a few questions to think about to help you determine if going to beauty school is right for you. #1. Are you a creative person? When people think of cosmetology, they often don’t think about creativity, but it’s essential in the world of beauty. The more creative you are, the more you’ll be able to help you clients achieve the looks they want. Keep in mind that, if you’re not overly creative now, it doesn’t mean that you beauty school is necessarily wrong for you. The right cosmetology program will help to foster and grow the creativity you do have, but it can definitely help if you already have an initial spark of creativity to begin with. #2. Do you consider yourself to be a people person? Customer service in the cosmetology industry is not like customer service in practically any other industry. Think about it: as a cashier, you interact with people all day, but only for a few minutes at a time. But when you are a cosmetologist, you are sometimes with the same client for hours at a time. Being a people person is imperative for your success in the industry. You can be the best stylist in Kennesaw, but if you can’t hold a conversation, it’ll be difficult to keep the clients coming back. #3. Can you see yourself doing hair and beauty for the rest of your life? 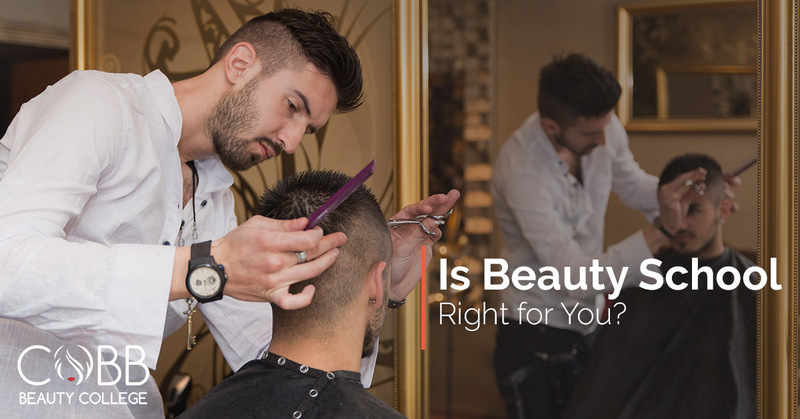 This is one of the most important questions you should ask yourself when determining if cosmetology school is right for you. When you finish beauty school and get your license, you’ll be ready for a successful career in cosmetology, but you won’t get a degree that will help in any other field, so if you decide to completely change your plan for the future, you’ll have to start at square one again. For cosmetologists with a passion for what they do, every day is rewarding and reaffirming, but it’s important to make sure that cosmetology is really what you want to do with your life before you take the leap. At Cobb Beauty College, we are proud to say that we offer the best cosmetology program in Kennesaw, but that doesn’t mean that our program is automatically right for you, your needs or your future. We hope that these questions will help you determine the right path for you. If you would like to learn more about our beauty college, or you have questions or concerns about beauty school in general, please contact us!